Chestermere – The mood was FUN (as in FUNdraising) but there were some people who fought back the tears during the emotional ceremony at the Chestermere Recreation Centre Friday night at 7:00PM. The 3rd Annual Relay for Life kicked off their inspirational overnight event – a 12 hour walk around an illuminated track. The lighting around the track came from luminaries – candles that are placed inside special bags that bear the names of cancer survivors and/or loved ones who have lost their battle with cancer. The luminaries were lit during a moving ceremony at dusk. 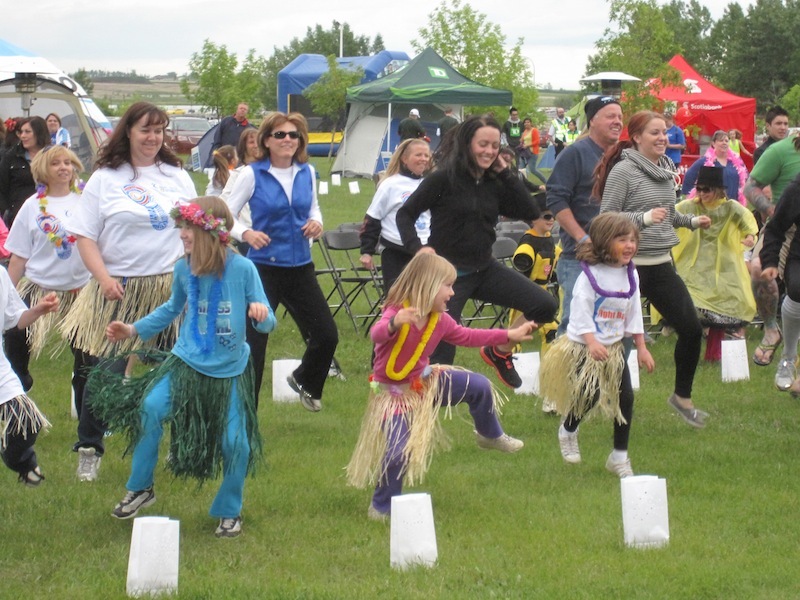 The Canadian Cancer Relay for Life is more than just a fundraiser. It is an opportunity to get together with family and friends to celebrate cancer survivors, remember loved ones lost to cancer and fight back in the hope of finding a cure for this terrible disease. Any age of participant is more than welcome as shown in the pictures. There were 17 teams that took part in the event with each one of them setting up a camp around the track. Relay For Life teams are asked to pick a team name and encouraged to decorate their campsite and create costumes which best demonstrate their team’s spirit. Why even Elvis showed up to make a personal contribution. An activity tent was provided for the children by ATCO Gas and a jumping castle to burn off extra energy. Who knew kids had extra energy? The entertainment went throughout the night with live music and a variety of shows to keep the participants occupied. Bruce McAllister (MLA) was on hand to host and interview each of the teams as they began their circuit around the track. Ah, but first were warm up exercises to stretch those muscles, just before the Survivors Victory Lap. The cancer survivors (about 30 of them) and their caregivers were lead onto the track by the Chestermere High School Band. A few short encouraging speeches from the organizers Colleen Corbiell and Connie McVittie, Chestermere Mayor Patricia Matthews and Tiffany Krause. Some very light rain began as each of the teams were interviewed by Bruce, then a pose for team pictures and there off!! Twelve hours of comradery for a very special cause. The 100 volunteers and 12 amazing committee members must have an honourable mention for their hard work and dedication to the cause. Of the 169 participants they have raised a total of $101,000, with the Cole Cancer Crusaders Team and Team Scotiabank each raising in excess of $10,000. WELL DONE one and all. The successful event wrapped up at 7:00 AM Saturday and plans have already begun for the Relay For Life 2013. It’s not too late to support the 2012 Relay For Life! The online fundraising system will remain active for a short time following this year’s Relay For Life.